Nursing assistant, receptionist, and preschool teacher—what do these three jobs have in common? Women. These are traditionally female-dominated careers. They also all involve helping people on a daily basis, a task in which many workers find satisfaction. But what if women could find this same quality, plus potentially better pay, in a sector often overlooked by the female workforce? The answer? Construction. 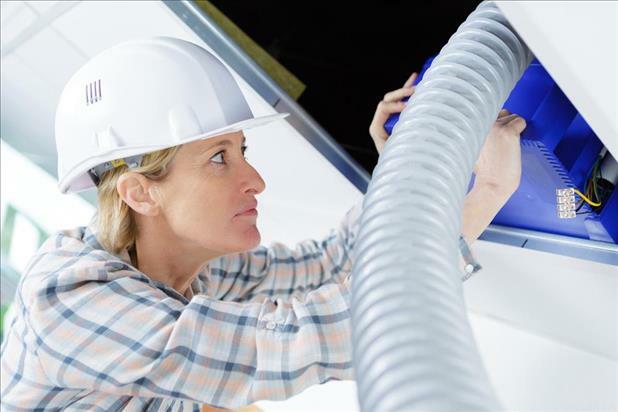 The growing construction field of heating, ventilation, air conditioning, and refrigeration (HVAC/R) offers some cool career opportunities for women, which are highlighted in the resource below. Women currently account for only 9 percent of U.S. construction workers, which presents a huge opportunity for those wishing to trade in their stethoscopes or telephones for toolboxes. According to data compiled by The Refrigeration School, Inc., women can learn the HVAC/R trade in less than a year at a fraction of the cost of a 4-year college degree: $16,600 for trade school versus $236,000 for private university. Once in the HVAC/R field, they could earn $48,320 a year compared to the $27,650 nursing assistants take home, the $29,120 receptionists earn, or the $33,300 preschool teachers typically make. And the best part? They’ll play a vital role in keeping the nation comfortable and healthy all year round.